REGENT Business School (RBS) is a leading Private Higher Education Institution in South Africa and registered in terms of the Higher Education Act (101 of 1997). This dynamic institution offers globally recognised affordable and accessible business and management education programmes. These programmes cover the areas of business administration, commerce, management and leadership, finance, entrepreneurship, local government, educational management and range from Higher Certificates to Postgraduate Degrees. In keeping with its mission, RBS’s students are drawn from a range of vocational backgrounds. Whilst RBS has a global reach, it attracts students mainly from South Africa, the Southern African Development Community (SADC) countries & other parts of Africa. The distance and supported distance mode of delivery, the relevance of the programmes curricula to the local and regional business context as well as the affordable fee structure makes RBS’s programmes a preferred choice for potential students wishing to pursue higher education in business and management qualifications. In delivering its range of management education programmes to a diversity of students from both the Public and Private Sectors, RBS has developed significant capacity with regards to infrastructure, academic and intellectual resources. Access to a large pool of experts in Management, Leadership, Commerce, Industry and Academia contributes positively to the delivery of its teaching and learning programmes. Through its active research focus, RBS is also at the cutting edge of the latest business leadership and management trends. REGENT Business School has developed a series of programmes that are designed to provide students and organisations with the management competencies and critical skills necessary to build and sustain competitive advantages in a rapidly changing and complex business environment. RBS’s expertise has evolved through continuous research and development undertaken in delivering a range of local and international business and management education programmes. As a specialised education and training provider of management related learning programmes RBS has the capacity, systems and resources to deliver courses with the flexibility of onsite, offsite as well as web-based teaching and learning. It is well known that successful companies make deliberate efforts to ensure that training of staff does not compromise production and business time. RBS delivers courses that are flexible and supported through a range of support facilities and services i.e. telephonic support, face to face lectures, online and web support and virtual classrooms. This strategy contributes significantly in placing partner organisations at the forefront of competitiveness having their staff trained and uplifted whilst still maintaining optimal productivity. Above all else, RBS takes great pride in providing our graduates with critical thinking and soft skills that empowers them with well-thought-out insights into the theoretical and practical aspects of a rapidly changing external environment within which businesses are obliged to operate. In terms of its social responsibility, RBS partners with a range of non-governmental organistaions in the quest to empower local communities through entreprenarial outreach projects. In addition to flagship programme the MBA, the institution offers a range of programmes from Post-Graduate Diplomas, Bachelor Degrees, Diplomas and Higher Certificates. In addition to its standard academic programmes, RBS is accredited with various sector education and training authorities which include: Local Government SETA (LGSETA), MICT SETA, ETDP SETA, INSETA, W&R SETA and CATHSETA. RBS has partnered with many leading South African Private Companies and Public Secor Organisations in providing Executive Education and Short Programmes to their Senior Personnel. Notable amongst these are ABSA, MASS Discounters, COSATU, ACSA and SARS. RBS has partnerships with various organisations with South Africa, Africa and globally. The institute is a member of the South African Business Schools’ Association, the American University in Cairo, SUIBE in China, MBA Nova in Russia, Gitam University in India and the Arabian Research Society. Since its inception in 1998, RBS has come a long way in being recognised as a global brand. The institution has accreditation from the South African Council on Higher Education, is registered with the South African Department of Higher Education and Trianing, the South African Qualifications Authority, the Namibian Qualifications Authority, the Mauritian Tertiary Education Council, the Association of Accounting Technicians and has a Two Palm Award – Global Ranking Status with Eduniversal. 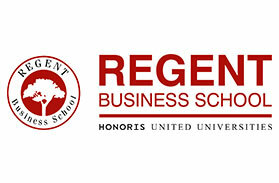 REGENT Business School (RBS) has dedicated itself to a “student-centric” philosophy by continually reviewing the curricula of its programmes to ensure there is alignment with regulatory requirements and relevance to the changing needs of various work environments in which students find themselves. In sync with this, the institution’s teaching and learning strategy continues to be reviewed to ensure that it lives up its commitment to “taking the distance out of distance learning.” RBS continues to optimise the use of technology to support and enrich interaction with its students, irrespective of their geographical location. To make all this possible, RBS has invested in a magnificent new main campus located on the Eastern Seaboard of South Africa. The Campus is located on the shores of the Indian Ocean and neighbours the Port of Durban. The new campus is home to key departments that support and complement teaching and learning, research and outreach. RBS continues to gain rapid recognition as one of the most innovative private business schools in South Africa. A growing professoriate of academics has added a vibrant collegial feel of academic engagement and research to RBS. Given that research is an intrinsic aspect of any academic endeavour, RBS is proud to state that its academics are obliged to undertake relevant research and publish the outcomes thereof in internationally recognised peer-reviewed journals. To complement its academic programmes, RBS regularly holds public lectures, seminars, workshops, master classes and symposiums. Our staff also present research papers at local and international conferences. In 2017 the institution is running an ‘eight part series’ of Seminars dealing with Critical Conversations in Sustainability. The series is live-streamed and open to the general public, staff and students. Video copies of these events are available through Youtube. Within the context of globalisation, RBS has established centres of excellence and these operate in partnership with other global organisations. The Institute of Entrepreneurship which was recently launched and housed in a new facility at the Durban campus.The centre for Islamic Finance and Banking , one the very few in Africa, works very closely with business community to become compliant with Shariah Law and Banking. REGENT has also established the Centre for the BRICS Business Schools Association and its international headquarters is locate at REGENT Business School. The centre for Public Sector Administration Management and Innovation focuses on research, training and development within the public sector. REGENT Business School’s Head Office is situated in Durban, South Africa and the Johannesburg campus is based in the economic hub of Southern Africa and Africa.